I love weekends because I get to use the slow cooker. Everything is prepped and ready for the slow cooker in the early afternoon, and dinner's ready in the evening. The combination of bread and milk mixed with the turkey forms a panade - a gel which coats the proteins in the turkey and prevents the meat from becoming touch. I used the food processor to quickly mince the onions and garlic. Since most recipes rarely call for using a can of tomato paste, do what I do - buy the paste that's in a tube. Squeeze out what you need, screw on the top, then pop it back in your refrigerator. While soy sauce may seem like an out of place ingredient in this recipe, it's rich in glutamates, which give the dish a meaty flavor. Once served, I topped the chili with cheddar cheese, plain Greek yogurt and chopped scallions. Use a slow cooker liner to make cleanup easy. Heat the oil in a large skillet. Add the onions, garlic chili powder, tomato paste, cumin, chipotle chili powder, oregano and red pepper flakes. Saute, stirring occasionally until the vegetables are softened and lightly browned - about 8 to 10 minutes. Stir in the turkey mixture, breaking it up into small pieces. Cook until the turkey is no longer pink - about 5-7 minutes. Add the mixture to the slow cooker. Stir in the diced tomatoes (undrained), chicken broth, soy sauce, sugar, and minced chipotles. Cover and cook on low until the turkey is tender - about 4 to 6. 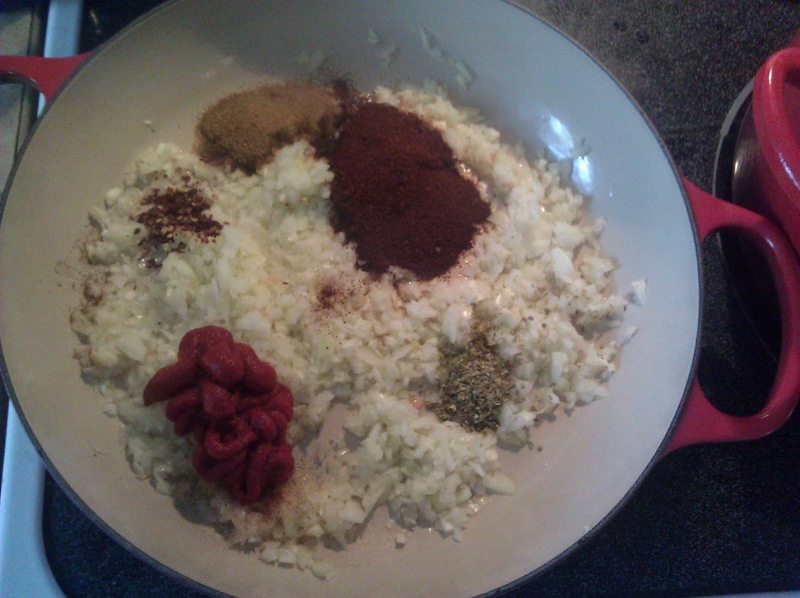 Skim the top of the chili to remove any excess fat and serve.